So, we're past half way of our 1 week detox and it feels like we're kinda getting into the swing of it. I'm enjoying it more than I thought I would, despite the headaches, insatiable hunger and constant sweet tooth! For lunch today we had Tomatoes on Ryvita. Sounds dry & boring, right? Not at all. 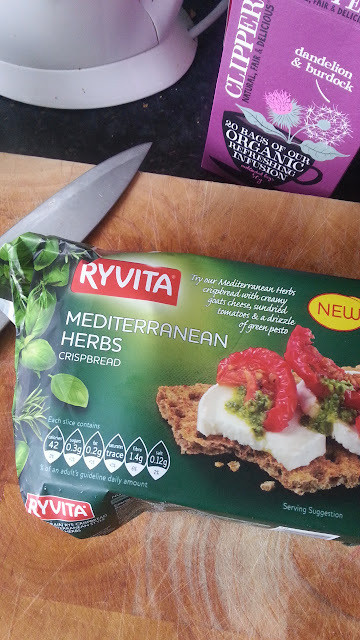 I recommend the Mediteranean Herb Ryvita fresh from the pack. It's easy to make. For Kate I did it like this: spread the Ryvita with Soya Spread (yep, that's right, we're using a Soya substitute this week instead of butter or olive spread). Thinly slice a tomato and place over the Ryvita. Put rocket (love rocket!) on top and salt and black pepper to taste. The next one I made (which was for me) I improvised by making a salsa of sorts. I chopped the tomato and mixed with rocket in a bowl with salt and pepper and a squeeze of lemon. Yum. By the way, you may notice in the background of the pic a box of Dandelion & Burdock tea. Have you tried this? It tastes exactly like the fizzy drink, but warm and flat. Weird! Oh, and that's my favourite knife. I use it for almost everything.